We’ve had great weather here the past few weekends and feels like summer is trying to make an early entrance. This weather just makes me feel like bringing out my summer dresses and tank tops I stashed away for the winter. It also makes me crave more ice cream….actually, ice pops. Spicy, sweet, sour ice pops for my month long tribute to Mexico! Honestly I can have ice cream throughout the year but ice pops or quimalitos, as we say in Dominican Republic, or snow cones (Frio Frio or Piraguas depending on where you’re from), are for me, treats I will only have in the Summer. They’re refreshing, sweet and supposed to go with tank tops and shorty shorts…ok, reality check, I’m no spring chicken so Bermuda shorts will have to do. I’ve always made my own ice pops but wanted to try different flavors. I remember making these when I was about 7 or 8 years old. In our house we made mini pops in ice cube trays all the time. We used evaporated milk, sugar, cinnamon, and stuck toothpicks in them…simple and delicious. Today, because I think of myself to be a bit more sophisticated, ha ha, I use fresh fruits and look to create interesting flavors. I must confess though, that the evaporated milk quimalito will never go out of style for me! 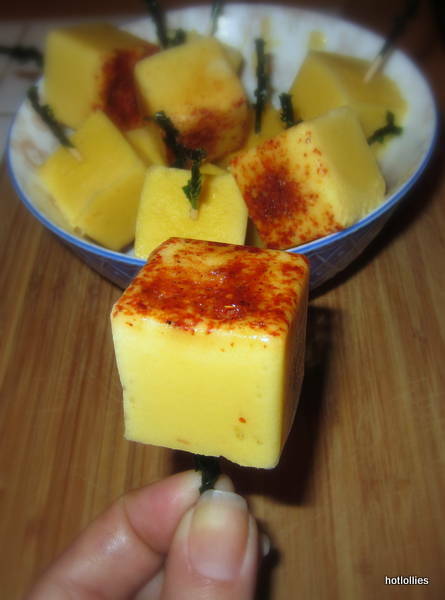 This time I made a special spicy treat using mangoes, coconut milk and tajin. I got his idea from seeing countless Mexican ladies selling mangoes sprinkled with chile pepper when going to watch the Mets at the old Shea stadium. The sweet and spicy go very well together and it’s a combination used in a lot of cultures. In Mexico I’m sure you find this everywhere from street vendors selling spicy fruits, to lollipops dipped in chile pepper powder and to fruit ices served with chile. 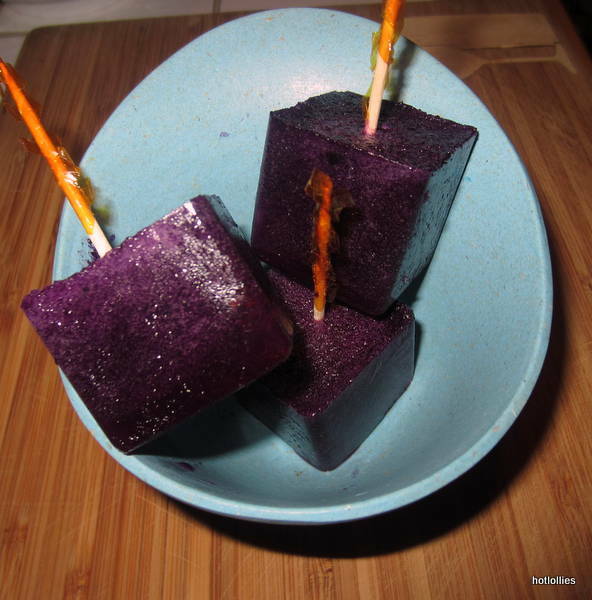 The flavors work well and the tajin, which is a special blend of chile pepper infused with lime, adds some acidity to this popsicle that works with the coconut milk. 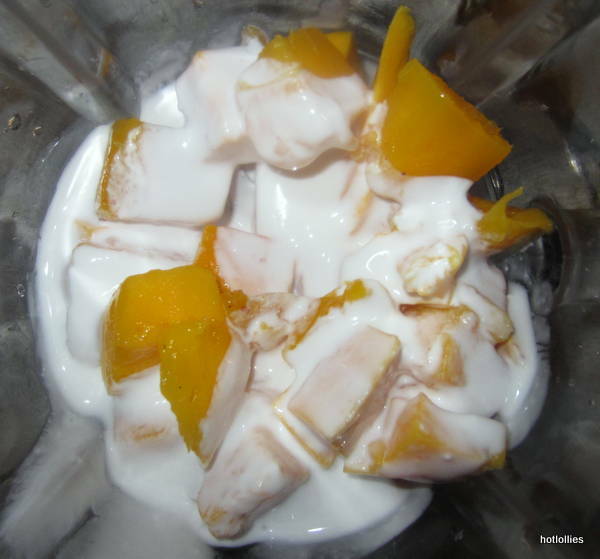 Just add ingredients to a blender and freeze! Add all, except tajin, to blender and puree. Add more coconut milk if too thick. 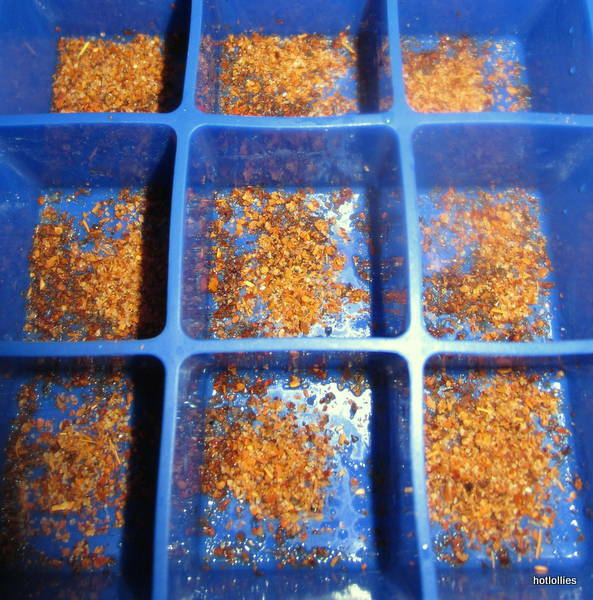 Sprinkle Tajin into ice cube trays. If you don’t have tajin, you can replace it with a chile powder blend you like. Pour blended mixture into trays and freeze. About 1/2 or hour into freezing, stick toothpicks in! 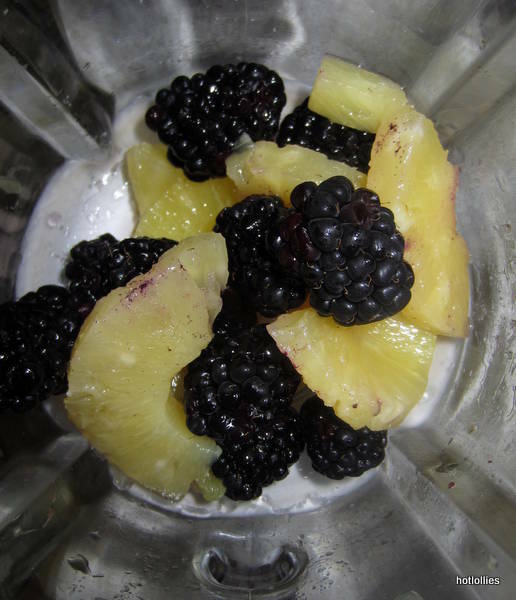 I also mixed up blackberries, pineapples and added a little spice to that too. It’s fruity, healthy and all natural!! These are so incredibly good and great for snacking when you want to cool off and head back outside to enjoy that sunshine!! Add all, except tajin, to blender and puree. Add more juice if too thick. 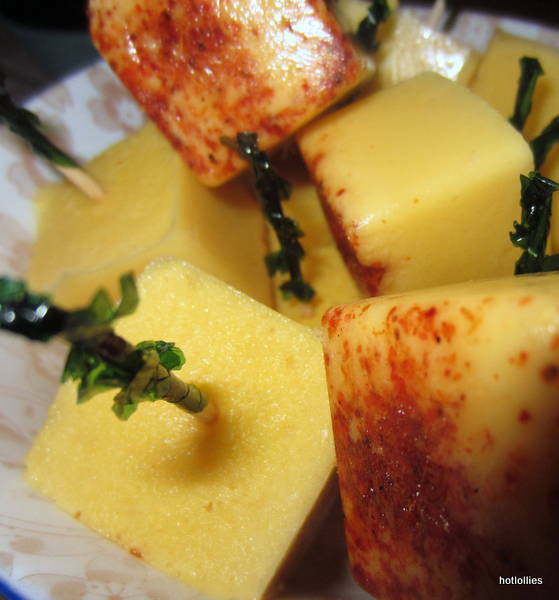 Sprinkle Tajin into ice cube trays. Mixture will be chunky and that’s fine. You could strain to get some of the seeds from the blackberries out but make sure you add back some of the fruit pulp. Pour blended mixture into trays and freeze. About 1/2 or hour into freezing, stick toothpicks in!